Island UK-signed Norwegian singer-songwriter Sigrid is fast emerging as one of the most exciting new artists to watch this year. 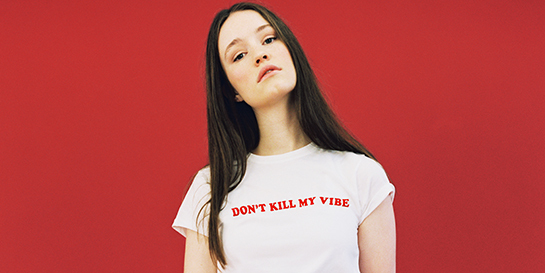 Majestic pop songs from the small town 20-year-old have already caught the attention of music fans, but Island have stepped it up a gear over the past month, sharing new material from Sigrid's upcoming Don't Kill My Vibe EP. Today Fake Friends has been released, the final track which wraps up the EP. The EP is named after Sigrid’s debut single which propelled her onto the pop scene in February. The track received a seal of approval from Sir Elton John as well as being highly praised by a number of publications such as i-D, The Fader and NME, with The Guardian labelling her as “the new Lorde”. DKMV acted as a perfect introduction to the pop sensation, with Island using the track to demonstrate her song-writing skills, expansive melodies, and fiery attitude. Also on the EP is DKMV’s follow-up Plot Twist, which was released on April 21 to introduce the Don’t Kill My Vibe EP. New Sigrid material has been released weekly since then, including a stripped back version of Dynamite with an accompanying video, and a Shazam exclusive behind the scenes video. Next week, Sigrid will perform a sold out headline show at Hoxton Square Bar & Kitchen, and has announced a September show at London Scala. She also has a festival-full summer, playing at The Great Escape, Latitude and Wilderness as well as at festivals across Europe.